Here are some of the recent articles about the 10th Annual Great Charity Challenge, at which our team of riders won us the grand prize! See below the Holiday Party photos for other mentions of Holy Ground in the media. 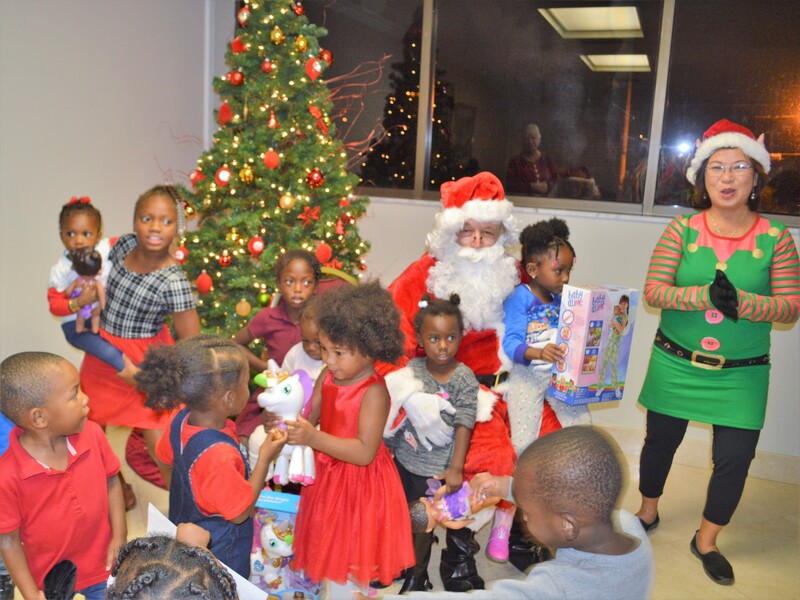 We had a visit from jolly old Saint Nick, who brought big gift bags for all the children and their moms! 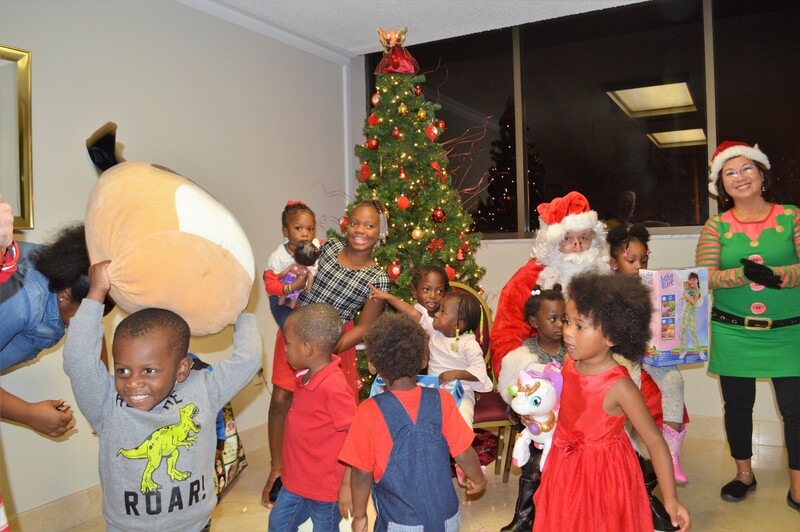 Look how much the kids enjoyed them! 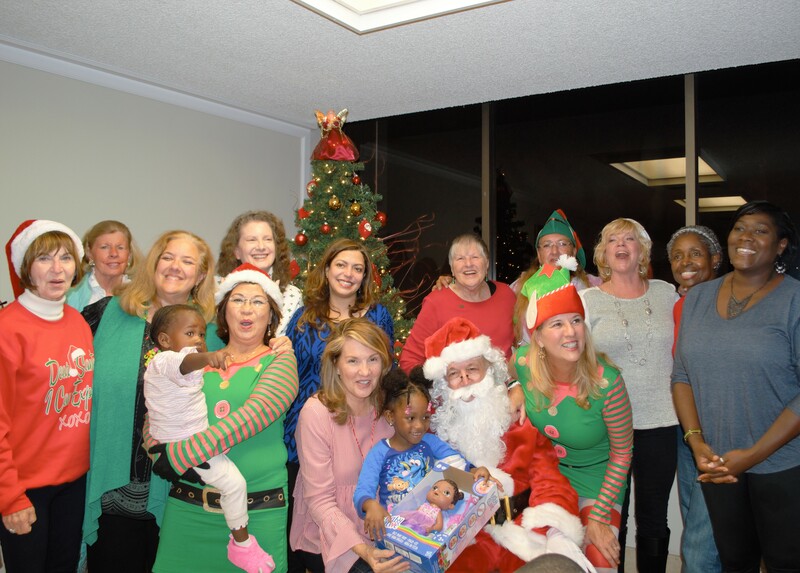 And our Holy Ground board, staff, volunteers and mentors had some fun, too! THANK YOU to all who donated, planned, organized, decorated, and cleaned, to make our annual party as wonderful as always! Boca Magazine recently published this article about our new residential property, the Stockard Family Campus, highlighting the importance of our program. 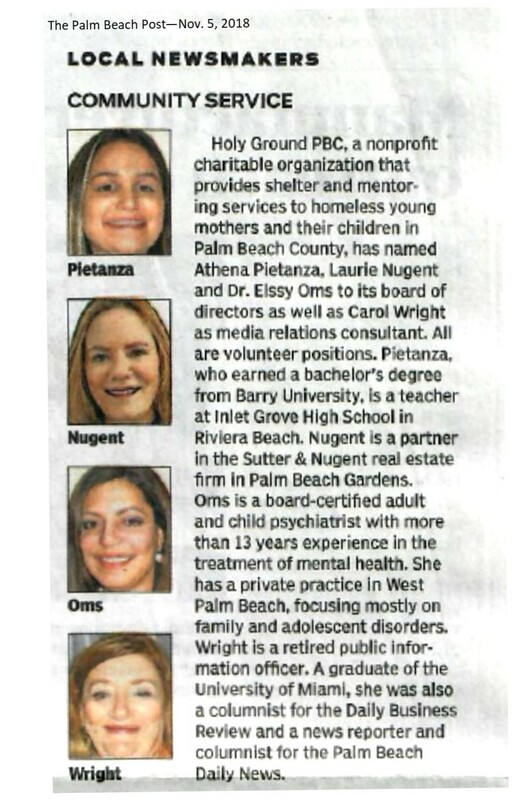 Our three new board members and our new media relations volunteer were mentioned in this Palm Beach Post article, describing the wealth of experience each one brings to our organization. Welcome to the family, Athena, Laurie, Dr. Oms and Carol! Our Vice President, Jan Kranich, was interviewed on Channel 5. She talked about our program and highlighted how we differ from other similar programs in the area. Our Development and Vocational Director, Angela Wing-Allen, had previously been interviewed on Channel 5 as part of a story on the Quantum in the Community Celebration Breakfast. During the breakfast, Holy Ground received the check for a $10,000 grant from Quantum in the Community. Thank you, Quantum, for your continuing support. We would not have gotten this far without you! Also at the breakfast, Holy Ground won the 2017 Quantum in the Community Media Opportunity! Thanks to this award (valued at over $2000! ), we have been featured in the “Worth Knowing” segment of the Feb 9, 2018 edition of Palm Beach Society magazine. We are so grateful to Quantum for affording us this marvelous opportunity to spread the word about our program! We have also been spotlighted in the Notables section of the Palm Beach Post, once again thanks to Quantum! Please read this wonderful feature article about our program.